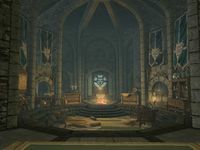 Myrwatch is a mage tower player home in Hjaalmarch, east of Morthal. 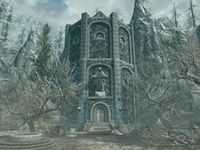 The tower was built in the Third Era by rogue mages from the College of Winterhold, and it closely resembles College architecture. Myrwatch consists of two areas connected by portal, Myrwatch and Myrwatch Gallery. Myrwatch: Locate and enter a mysterious tower. The tower is built partially in the water, with a small bridge crossing over to a narrow stretch of swampy land. The body of Hans lies against a tree stump to the north, next to an empty wine bottle, woodcutter's axe, torch, and Sindnar's Tower Notes. A leveled chaurus guards this area and presumably killed Hans. The bridge has a seal depicting the Eye of Magnus. When you light it with a fire spell, the door to the tower unlocks and the magic fire nearby is lit. The main chamber is divided into a central area and two side areas. The central area is dominated by an open fireplace. A piece of stalhrim can be found on a table against the left wall; maps of Solstheim and Skyrim are posted above. The right wall includes a table holding the Heavy Armor skill book Chimarvamidium and a display case in the bookshelf containing a glass dagger, flawless emerald, flawless sapphire, and Ring of Illusion. Anora's Journal lies on a table here. The side area right of the door has two bookshelves you can fill, two beds, and a chest above the bookshelf farther from the door. In the back of the chamber, there is a long dining table flanked by a cooking pot on the right and an oven on the left. The side area left of the door is more interesting. Just left of the oven is a small display area, with a mannequin, weapon plaque, safe, and chest. A double bed splits the side area in two. Left of this is a portal to the gallery above and further left is another empty bookshelf. On the inner wall across from the bookshelf is a Cure Disease Potion Recipe. Activate the portal and you'll be transported to another circular chamber. A large glowing blue orb hangs from the ceiling. The gallery is a crafting and display room. Immediately in front of you is a green arcane enchanter. Just above it is a grand soul gem and a holder for Saerek's Skull Key and Torsten's Skull Key. A number of smaller soul gems, the Enchanting skill book Catalogue of Weapon Enchantments, and a Spell Tome: Sparks sit on the enchanter table. The center of the gallery has an alchemy garden on the near side and an equipment crafting area opposite it. The garden has eleven empty planters and many more plants in between these. The crafting area consists of a tanning rack, grindstone, workbench, smelting pot (same as a smelter), and the "All Forge". The All Forge functions identically to a forge, but allows for crafting of items usually restricted to the Skyforge and Gunmar's forge. A variety of relevant materials sit on the shelves above. A multitude of displays can be found as you move counterclockwise from the portal. The first wall has three weapon plaques and a display case. Two mannequins flank the second wall; in the middle are weapon plaques and racks designed to hold Dragonborn items: Champion's Cudgel and Bloodskal Blade above and Glass Bow of the Stag Prince, Soulrender, Bloodscythe, and Dwarven Black Bow of Fate below. The inner side of the next section has an extremely rare staff enchanter, with six heart stones on the shelves behind it and unenchanted illusion and destruction staves in a basket on the ground. The outer wall opposite the enchanter has two more mannequins and two weapon plaques between them. Continuing counterclockwise, the next section has two display cases on the inner wall as well as two mannequins and five weapon plaques on the outer wall. The fifth wall right of the portal has a row of holders for each bug in a jar; a weapon plaque is posted on the inner and outer walls and the inner wall has a grand total of six weapon racks lining it. The next wall, directly across from the portal, features the same setup as Tundra Homestead for the dragon priest masks, minus Miraak. Six more weapon racks and a single weapon plaque line the next inner wall, across from which are racks for staves: the Skull of Corruption, Wabbajack, Sanguine Rose, Spider Control Rod, Staff of Magnus, and Staff of Jyrik Gauldurson. A wooden panel above these holds daggers: the Blade of Woe, Kahvozein's Fang, Nettlebane, Blade of Sacrifice, Mehrunes' Razor, and Keening. The next section, now the fourth left of the portal, has two more display cases on the inner wall, two mannequins on the outer wall, and between the mannequins four plaques meant to hold Wuuthrad, the Shield of Ysgramor, Spellbreaker, Targe of the Blooded, and Aetherial Shield. 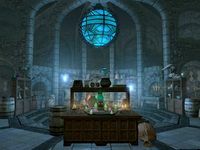 An alchemy lab sits at the end of the inner wall. Dozens of ingredients and potions are scattered on the table and shelves, most notably two samples of fire salts and one of frost salts. An expensive deadly recovery poison sits atop the shelf. Across from the lab are two additional mannequins guarding plaques for Dawnguard items: Dawnguard Rune Shield, Harkon's Sword, Dawnguard Rune Axe, and Dawnguard Rune Hammer. The penultimate wall holds a plaque for Auriel's Bow; holders for the five paragons sit below, beside static cupboards on which you can place the Initiate's Ewer and Auriel's Shield. The final wall has three generic weapon plaques and a display case. The location is marked on your map upon installation. Both the leveled chaurus enemy and Sindnar's Tower Notes respawn. Many of the items in Myrwatch Gallery have a tendency to fall over or fly off their shelves upon entering the area. A section of the water surrounding the path outside clips through the ground. ? The strongbox on the Arcane Enchanter table is not safe for storage. ? This page was last modified on 23 March 2019, at 20:06.